‘The Moon can be so different every time you see it.’ The illustrator of this luminous picture book shows the Moon’s phases above dark, atmospheric landscapes. Sometimes it is a thin curvy crescent with the whole of the Moon discernible only if you look carefully. ‘It’s the old Moon in the new Moon’s arms’ say some children staring out of a window. At other times the moon is full, sometimes silvery and sometimes an almost golden colour at harvest time. The strong black line often encloses a burst of bright colour – the orange coats of the fox family and the golden eyes of the owl. A lyrically written text creates some lovely images too: the full Moon looks like ‘a silver-coloured fruit dangling in the sky’. Questions and exclamations help create space in young minds for concepts to develop. The Moon is always there, even if we cannot see it in daytime unless it is a cloudless sky. 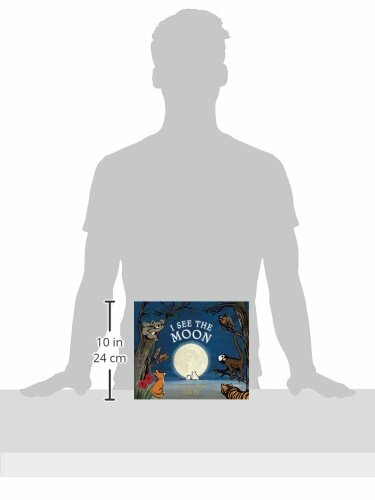 And by putting a tiger, koala, fox and rabbit into the landscapes, the book shows children that the Moon can be seen from every place across the world. Then, on the last double spread, the young learner’s imagination is put into top gear. We see a lunar landscape: ‘Imagine being there, like an astronaut.’ And, if we were, imagine seeing our Earth taking the place of the Moon in the heavens. Quite simply, this is a marvellous first introduction to the Moon and the night sky. Highly recommended.